Perforated 14, watermark 2 (Crown CA), engraved. Overprinted on stamps of Cape of Good Hope. There is no Scott #2. 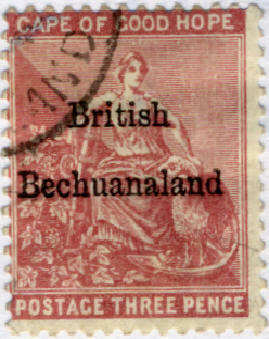 The overprint is in two lines: "British Bechuanaland". There is no period after "Bechuanaland" on genuine stamps. Stellaland was a stamp issuing entity before it was annexed by Great Britain and became a part of Bechuanaland which in turn was succeeded by Bechuanaland Protectorate as a stamp issuing entity.